« CEO Spotlight: Nick Smith, Elonex Outdoor Media, Birmingham, U.K.
Back in March 2017 Admedia, announced its new large format digital screen network called Admedia Nexus which was to be made up of large format landscape digital billboards that connected the UK’s top 20 conurbations. Both Reading West and Heston East, will be officially launched on August 14, 2017, bringing the Nexus network to a total of 18 screens. Both sites – utilising the latest in full-motion technology – are key locations on the M4 motorway, connecting London with the West Country and South Wales, and include top conurbations Bristol and Cardiff. The route is used by millions of motorists each week and is one of the busiest in the U.K where thousands of motorists stop weekly. The initial full-motion network of 16 D48 screens across top motorway service areas went live on April 10, 2017 and has since delivered a range of innovative campaigns by top advertisers including O2, Confused.com, Renault, 20th Century Fox and Paulton’s Park. The launch of the new sites coincide with the busy summer school holiday period, where millions more families use the motorway service areas during staycations, journeys to family and friends as well as day trips. 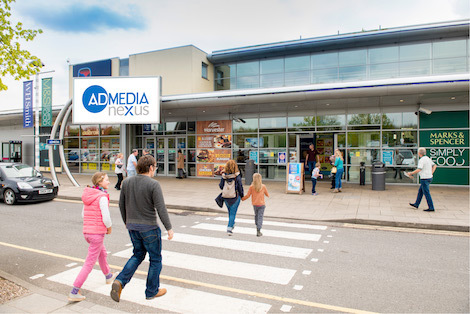 In a recent family research report conducted by Admedia in conjunction with YouGov and Market Management (2017), 72% of families stop at a motorway service area at least once during a 90 minute journey. Families are just one of six key audiences including SME, travel & tourism, entertainment and leisure, motoring and CTN, that motorway service areas are known to attract. This entry was posted on Monday, July 31st, 2017 at 13:29 @603 and is filed under DailyDOOH Update. You can follow any responses to this entry through the RSS 2.0 feed. You can leave a response, or trackback from your own site.